Crossrail helps launch Skills London 2012 - Crossrail . For information about the Elizabeth line please visit the Transport for London website. Crossrail this week exhibited at Skills London 2012, London’s biggest careers and skills event aimed at 15-24 year olds. Over 26,000 visitors attended over the two days on 23rd and 24th November. 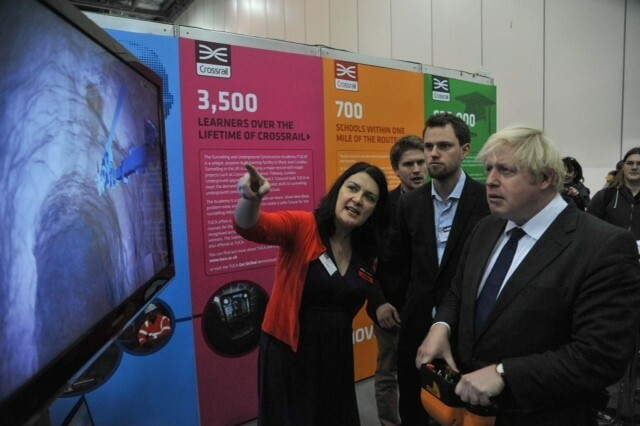 At the formal launch event the Mayor Boris Johnson and Crossrail Chairman Terry Morgan both highlighted the importance of apprenticeships and vocational training. The Crossrail stand provided information about the project including details of apprenticeships, Young Crossrail, Tunnelling and Underground Construction Academy (TUCA), and our new graduate scheme. The stand proved popular with the Mayor and the many visitors who tried the Sprayed Concrete Lining (SCL) simulator. There was also a separate TUCA Get Skilled demonstration stand, where visitors could find out more about courses and facilities on offer at the Crossrail-sponsored Academy and try their hand at steelfixing.